With the hustle and bustle of the holidays rapidly approaching, homebuyers are preparing their homes for guests, planning their holiday feasts, making traveling arrangements, and getting started on their holiday shopping. As a result, real estate tends to take a firm position in the backseat. 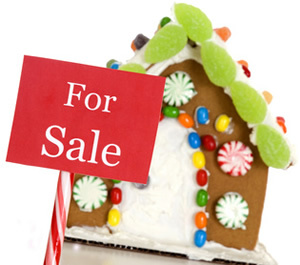 However, educated buyers are aware of the numerous benefits that accompany searching for homes during the season. Low housing inventory throughout the country has created a thriving real estate climate for sellers, but during the holidays, buyers receive the advantage. An unyielding focus and attention on holiday preparations reduces the amount of traffic from potential buyers to each listing. This lack of competition creates an optimal environment for buyers eager to find a deal. Real estate agents can take advantage of the holiday season by implementing a number of marketing tactics that will not only educate buyers and encourage them to continue their home search, but also attract new clients and reach out to past clients. Executing these unique, thoughtful marketing strategies is instrumental in building your business and avoiding the historically slow months ahead. Social Media Pages: Effectively utilizing your social media pages throughout the holidays can enhance your business, as there are a number of outlets available that will help educate buyers and sellers; promote listings, services, incentives or events; generate traffic to attract clients, and much more. Incorporate these suggestions into your social media pages to maximize interest and traffic to your page. Hold a contest or sweepstakes. Engage your audience on your social media pages by inviting friends, clients, neighbors and family to participate in a special holiday giveaway or promotion, and encourage them to visit your page throughout the season for additional contests to secure repeated exposure to your page, content, and business. Facebook’s advertising platform also allows you to advertise the contest and entice others to participate by liking your page. Be sure to include your contact information, company information, and logo on your site to familiarize new visitors. Ensure that your posts, blogs, marketing material, listing photos and virtual are reminiscent of the season. Update virtual tours or listing photos with a holiday theme, and showcase how great the listing looks for the holidays. Properly display your listings and post information frequently to optimize effectiveness. Post industry news to your social media pages. Maintain your page with industry news, blogs, listings, etc by sharing the link of an informative article on your social media sites. Write and post blogs about topics related to your clients or prospects, and promote it or advertise it on Facebook. Remind your clients that you are not just a business. Personalize your social media pages with posts about holiday experiences, a holiday recipe, and photos of your decorations or family in combination with business related posts to remind them that you are a real person who cares. Utilize Email Marketing Services: Email marketing provides a great opportunity to promote your services, announce special offers or discounts, share seasonal tips or industry related articles, and more. Mail Chimp, Constant Contact, and other email marketing services. These services allow you to conveniently and frequently send announcements, promotions, industry news, etc to your database. Include links to your social media pages and social share to create traffic and optimize exposure. E-flyers offer the same capabilities as email marketing services. Optimize the season by utilizing a holiday theme, complete with pictures, articles, links to information, and more. In addition, E-flyers allow you to utilize syndication tools to reach a broad audience. Offer Seasonal Tips, Promotions and Hints: Rather than bombarding people with a sales pitch, stay at the forefront of their mind by sending them helpful tips that will captivate their attention and elevate their interest. Send out helpful blogs and articles. Create flyers with holiday preparation tips, scrumptious holiday recipes, special holiday events, articles relating to the season, etc. Strategically place your contact information, logo, and company information on the marketing piece you are sending, and invite them to contact you for additional tips or services. Announce holiday discount packages with companies or vendors. Partner with local businesses or vendors to create a holiday discount package on products or services that will accommodate your clients’ needs throughout the season (i.e. snow removal, HVAC, decoration and light installation, cleaning services, etc). Create a gift card or postcard about the special discounts offered exclusively to your clients. Mail it to them with information about the companies involved and a description of their services. Personalize Your Approach: There are several marketing ideas that will ensure that both you as a person and your real estate business will stand out to clients over the holidays. Hold festive events at your office or at home, and invite your clients. Engage with your past clients, current clients, and potential clients by inviting them to attend a holiday party or event at your home or office. Better yet, hold a party in appreciation of your clients. Brand some unique, thoughtful gifts, and send them to your clients. Thank clients for their business and loyalty with thoughtful holiday gifts, like homemade truffles, nice wine, tickets to a show, their favorite dessert. Invest in a custom label on a bottle of wine, or use a custom container for food. Include high end promotional products with your gifts, like a calendar with your logo, contact information, and a personalized message, or enclose a holiday-to-do-list. The thought will be greatly appreciated and the subtle branding will ensure clients remember your services. A simple holiday greeting goes a long way when creating and maintaining solid professional relationships. Send Holiday E-cards, complete with animation and music that add personal flare and links to your social media sites. Real estate agents can also utilize festive REALTOR® holiday cards to send warm wishes to clients, and remind them that you are a REALTOR® who cares and understands what they want and need. Sponsor a cause or donate your time: Contributing your time or resources to a worthy cause will guarantee an admirable reputation and solidify the respect and loyalty of your clients and the community. Set out a donation box for clothing/toys. Inform your neighbors, clients, colleagues and family that you will have a donation box at your office or home to accumulate items that you can send to those less fortunate. Invite them to participate by donating old coats, scarves, toys, games, etc. Promote your efforts on your social media, and encourage participants to visit your page for updates. Follow up with information regarding the outcome of your efforts, and thank them for their contribution. Donate your time or money to a special charity or cause. Email your clients, friends, neighbors, colleagues, etc. to let them know what you are doing, for who, and why. Offer them a discount or rebate for future services in exchange for their donation, or let them know that you have contributed your time or money on their behalf. While the holidays are undoubtedly the optimal occasion for enjoying family and friends, it is crucial that the opportunity for marketing is not overlooked. Attracting new clients during the holidays doesn’t have to be a daunting task. The trick is staying engaged with past clients, current clients and prospects to generate exposure of your brand. Set yourself apart from the surplus of holiday mail by being bold and innovative in your method of communication, as well as meticulous with the frequency, design and content of your message. Use over sized mail pieces, quality graphics, vibrant color, holiday themes, and quality information to secure the effectiveness and efficiency of your holiday marketing. actually fastidious funny information too. your website page and to this point? I surprised with the research you made to make this actual publish extraordinary. The place else may anybody get that kind of information in such a perfect method of writing? Hello to every body, it’s my first pay a quick visit of this web site; this webpage carries remarkable and actually fine material in support of visitors. a quick visit this website, it includes useful Information.